SAN FRANCISCO ? The failure of aJapanese probe to enter orbitaround Venus last week will likely cause the nation's space program todialback its ambitions a bit, a mission scientist said. 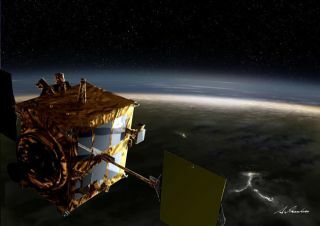 Researchers are still working hard tofigure out what causedthe Akatsuki spacecraft to overshootVenus on the night of Dec. 6. But the miss ? coupled with the2003 failureof Japan's only other interplanetary effort, the Nozomi mission to Mars? hasalready imparted some key lessons, the scientist said. "Our score is zero wins, two losses,"TakehikoSatoh, of the Japan Aerospace Exploration Agency (JAXA), told SPACE.comhereyesterday (Dec. 16) at the 2010 fall meeting of the AmericanGeophysical Union. "We have to be more conservative to plan our next planetary mission, soitwill never fail in any aspect." After more than six months ofinterplanetary travel, the$300 million Akatsukispacecraft ? whose name means "dawn" in Japanese ? got within342miles (550 kilometers) of Venus the night of Dec. 6. It began firingitsthrusters in an orbital-insertion burn, to slow the craft enough to lettheplanet's gravity snag it. Mission scientists don't know theroot cause of the problem,Satoh said. "The pressure decrease was the directcause," hesaid. "But we don't know why the pressure shut down." Previous speculation that a collisionwith somesort of impactor caused Akatsuki's problems is almostcertainly off themark, Satoh added. "That's highly unlikely," he said. Akatsuki scientists want to get ahandle on what exactlywent wrong by February at the latest, Satoh said. That's because theteam wantsAkatsuki to perform an orbit-correction burn in April. The idea is to position thespacecraft for another run atVenus when the probe gets close enough again, which should happen inabout sixyears, Satoh said. That attempt would likely take place betweenNovember 2016and January 2017. The Akatsuki team is cautiouslyoptimistic that the probewill make good on its next attempt six years from now, said Satoh, whois theprincipal investigator for one of the spacecraft's infrared cameras. The probe likely has enough fuel leftto make a secondorbital-insertion burn, he added, since it used so little on the firstattempt. Akatsuki's battery should be able tohold out for anothersix years, and the probe's shielding should be good enough to protectit fromdamaging radiation during its annual 200-day trips around the sun,Satoh said. If the team can fix the fuel-lineproblem, the probe maywell redeem itself down the road. Satoh said that scientists can drawinspiration from Japan's Hayabusa asteroid-sampling mission, whichlooked to bedead and gone but made a triumphantreturn to Earth, carrying bits of space rock as planned. "Everybody thought Hayabusa wasunrecoverable,"Satoh said. "We now share that never-give-up-spirit with the Hayabusateam." Whether or not Akatsuki makes acomeback six years from now,the probe's initial failure will have a big impact on how JAXA plansfutureplanetary missions, Satoh said. The space agency will likely hew tomore conservative ideas inthe near future, he said. Satoh is involved with a working groupconsidering afuture Mars mission, and he used the Red Planet as an example of whathe meant. "With Mars exploration, so manyscientists want a biglander or a big rover," he said. "If we had previous successes withplanetary orbital insertions, we might say, OK, we'll try somethingbig. Butnow, maybe we can do an orbiter and a very small lander or a smallrover." Nothing, in other words, on the scaleof NASA's car-sized Curiosityrover, which is slated to land on the Red Planet in August2012. "We can dream of that," Satoh saidwith a laugh. "But it must be in the farther future." He also said Japan may want toconsider collaborating morewith NASA and the European Space Agency, to learn from those agency'ssuccesses. DidCollision Cause Japanese Probe to Miss Venus?